Chancel Choir will not meet this Wednesday during CommUNITY Dinner. Jan 16 & 23 will be off campus choir practice. Please see Kevin Lusk for more information. Join us for a Great Night of Methodist Singing on Sunday, January 27, 2019, at 6:00 p.m. at the Mattie Kelly Arts Center. General seating is available for this evening and a love offering will be taken. Come see the full list of possible priorities established by our home meetings that we'll be praying over during the next few months! Dinner will be served at 5:30PM in The Crossroads Center. Menu is beef stew, rolls, and salad. Please bring a dessert to share if you are able. Youth will gather at the same time, 6:00PM. Kid’s Street & Nursery will be at the usual time, 6:15PM on Kid's Street. Check out the new studies slated for Spring and peruse the books during CommUNITY Dinner this Wednesday evening, Jan 9, and Sunday, January 13, from 9:30-11:00AM in The Crossroads Center. Sign up sheets are available. All men are invited to the next UMM meeting at 6:00PM in the Fellowship Hall on Mon, Jan 14. Yarnies will meet at 6:00PM in room 213 on the 15 & 29 of January. We'll get back to our normal schedule of the 2cnd and 4th Tuesdays in February! The Vines & Branches Sunday School class, led by Lee Thigpen, would like to invite you to a new study starting January 6. Start the New Year with us as we explore The Beatitudes by J. Ellsworth Kalas. We will reflect on the true happiness and joy that Christ brings to us. It is a 12 week study and we meet at 9:45AM in The Crossroads Center. The church office will be closing at 12:00PM on Thursday, Dec 20 and will reopen in the New Year on Wednesday, Jan 2 at 9:00AM. Merry Christmas from your FUMC staff! 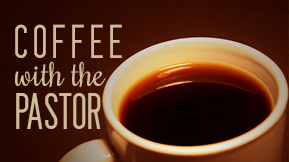 If you have any questions on Methodism, about our church, or how to join FUMC, you’re invited to meet Pastor Michael at the Casbah Coffee Co. (196 W Pine Ave, Crestview, FL 32536 off of Main Street) Wed, Jan 2 at 6:15PM. Your first cup of coffee is his treat! All women are invited to the next meeting that will be held on Friday, Jan 4 from 9-11:00AM in room 213. 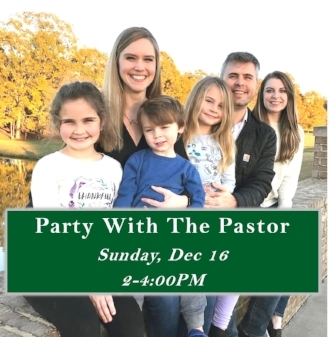 Michael, Jennifer and the kids are welcoming all to their home Sun, Dec 16 from 2-4:00PM for a ‘Come & Go’ Christmas party! See Sunday’s bulletin or call the church office for more info. Celebrate all of the wonder of our Savior’s birth at our traditional Christmas Eve Candlelight Service. Join us at 6:30PM on Monday, December 24 in the Sanctuary. All monetary donations given during the offertory will go towards the United Methodist Children's Home. *Nursery is unavailable for our Christmas Eve Service. We start at 9:00AM in The Crossroads Center to prepare simple gifts of kindness & grace and write Christmas cards that we will deliver to first responders, local restaurants, and other locations where people will be working for Christmas. We’ll have refreshments and hot coffee to keep everyone's spirits bright as we serve together. We'll wrap things up at 10:45, just in time for a special combined worship service featuring our choir’s Christmas Cantata, which begins at 11:00AM. We’ll have nursery Care for ages 6 weeks to 4 years, beginning at 8:30AM. All other ages are welcome to join in the Acts of Kindness & Cantata. Our 3rd annual Acts of Kindness Day will be on December 23rd from 9 am - 10:30 am in the Crossroads Center. Join us for a festive time of fellowship & fun as we sign Christmas cards assemble simple Gifts of Grace and Kindness for those in our community who are working this holiday season. Projects & cards will be provided. YOU are needed for assembly, prayer & delivery! -Please be sure to bring a breakfast or brunch type item (muffins, breads, baked goods, or fruit) to share during our time of fellowship! If you have any questions on Methodism, about our church, or how to join FUMC, you’re invited to meet Pastor Michael at the Casbah Coffee Co. (196 W Pine Ave, Crestview, FL 32536 off of Main Street) Wed, Dec 5 at 6:15PM. Your first cup of coffee is his treat! 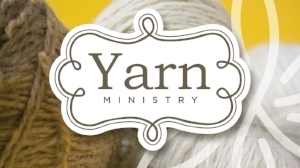 Yarnies will be meeting this Tues, Nov 27 at 6:00PM in room 213. All invited! Everyone is welcome to join in on our Christmas Card signing party on Thurs, November 29 from 9:00AM-1:00PM in room 212. We are in need of stamps, not cards. Thank you! Funeral services for Allen Cook will be Saturday, Dec 1 in our Main Sanctuary. Visitation will be at 1:00PM, with the service at 2:00PM.